If you like laughing and socks and the you just need these The Joker socks. 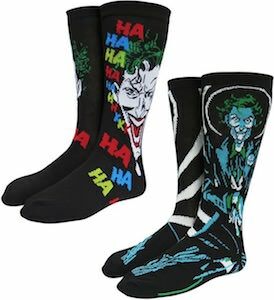 The socks come in a set of two pairs and each pair looks different but both show The Joker on it and as expected one pair shows the Batman villain laughing his brains out with colorful laughter. And these Joker socks will look great on both men and women and are made from 97% polyester and 3^% spandex. Now just wearing socks makes you a bit more like a DC Comics villain so no matter what outfit your wear from a nice suit to comfy jeans these crew socks go with anything you wear.